Two rooms stood out for good sound without an astronomical price tag. 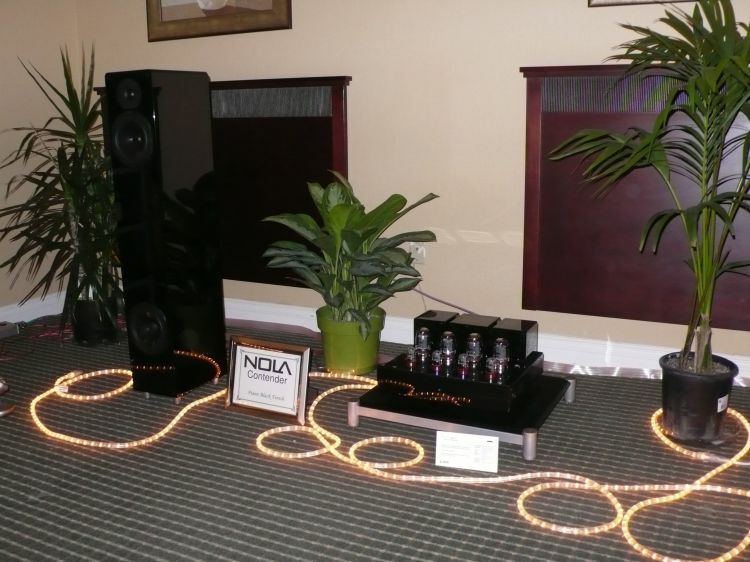 The first was the Nola Contender loudspeaker ($3400) driven by a PrimaLuna PA-1 integrated amplifier ($2995). 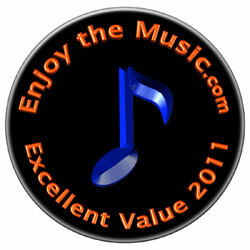 The system sounded remarkably refined, detailed, dynamic, and uncolored. Since this is a combination home high-end audio/video, wine & cigar gathering plus a car show… First we have Kevin Deal of Upscale Audio brought his BMW Isetta 300. This is such a Cute little thing and according to Wikipedia, “The BMW Isetta was in 1955 the world’s first mass-production 3-Liters/100km car”. 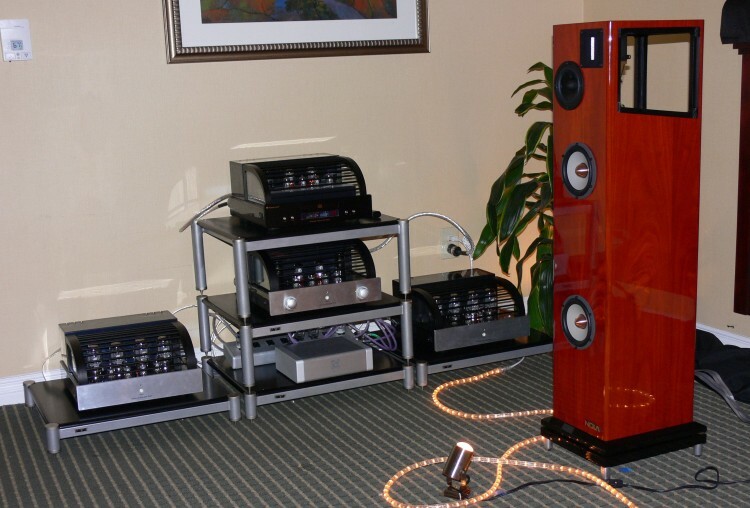 Kevin Deal of Upscale Audio has great ‘deals’ on tubes. And yes, pun is indeed intended. 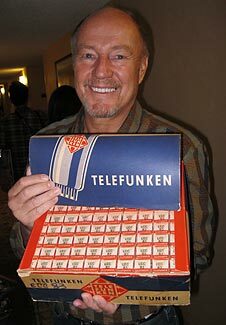 Ok, maybe this $225 each smooth plate Telefunken 12AX7 might seem costly, yet over a lifetime they can really make a big difference in your tube preamplifier or phonostage. The Nola Contender speakers ($3400 per pair) were making some serious big and solid powerful sound considering their slim size. The soft dome tweeter was smooth and this three-way unit was really impressing me. The lower woofer has its own separate internal enclosure per se. Seriously, if you get chance then by all mean go hear these and be ready for a nice surprise. I remember the PrimaLuna electronics when just starting out. They were great for the price and solid performers, but they have gone through some serious evolution over the years because the sound was gorgeous. The beautiful Nola speakers were no doubt doing their part in this system, which was wisely judged in terms of speaker size vs. room size. Large-scale dynamics from the slim 3-way Nola Contender and PrimaLuna amplification. Initial impression of the Nola was WOW. Nola and PrimaLuna were in the same room. The PrimaLuna ‘Dialogue Three’ pre-amp was being used. 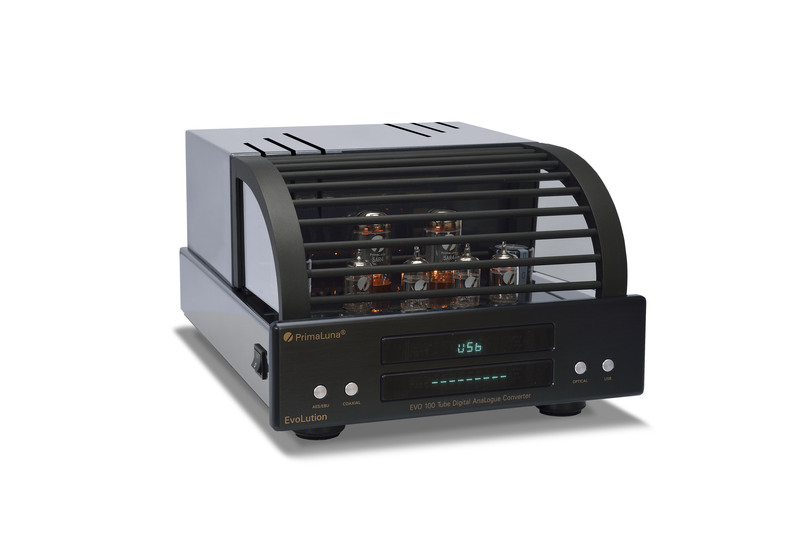 This is a tube dual-mono pre-amp using 5AR4 tubes, Solen and Swellong capacitor, and has 11.5db of gain. The Amps used were ‘DiaLogue Seven’ monoblocks that use 2x12AX7’s, 2x12AY7’s, and 4xEL34’s tubes. 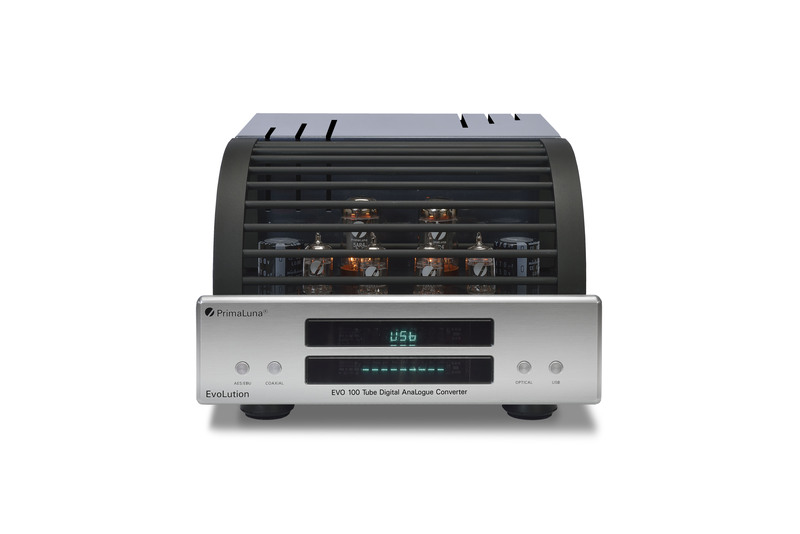 This amp has a Triode mode at 40 watts per and a ultra-linear mode at 70watts per. 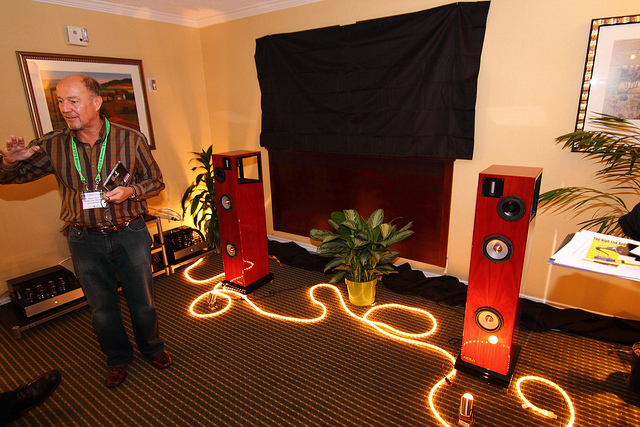 The Nola speakers on display were the ‘Metro Grand Reference.’ These are a compact floor standing speaker. They have two 6.5 magnesium cone woofers, one open baffle Alnico mid, and an open baffle ribbon tweeter.